If global warming is likely to be the biggest problem facing society in the coming years, it will certainly be competing with housing as an issue of great public concern. While the situation is probably most severe in Barcelona, the people of a medium-sized Catalan town such as Vilafranca del Penedès are certainly not free from these pressures. One group who have acted against what they see as a major cause of housing difficulties is a squatter's collective that supports the politics of the Esquerra Independentista [independent left] movement. Recently, they took occupation of a former industrial building in the north of Vilafranca and have re-named it “El Taller” (The Workshop). According to the collective, the site they have taken over has been empty for at least four years, and is zoned to be eventually knocked down for redevelopment. In a very different position to those who occupy vacant buildings are Vilafranca residents, Teresa and Jose. They have a rural property outside the town that is being lived in by a man without their permission. The couple have tried to avoid legal proceedings with the squatter for several years but have recently changed their approach of attempts at persuasion and conciliation. “The procedure has taken two months to get to court and has cost us two thousand euros, but at the moment he's still there and he has smashed up half the house,” says Jose. Speaking to some other people over lunch in Vilafranca, it is not difficult to find a common theme. There seems to be an acceptance that the government could not or would not do much to solve problems relating to housing. Apart from one suggestion that taxes should be reduced on houses, there is little genuine hope that improvements were possible coming from elected representatives. Without knowing it, another woman also agrees with the squatters collective on the subject of profiteering in the real estate industry. She suggests that the high levels of speculation now means that for single people it is impossible to buy a house or even rent a decent apartment. “Everyone has to live with their parents or share accommodation with at least one other person if they are to afford to have any quality of life,” she argues. There is something here that is beyond dispute, though. 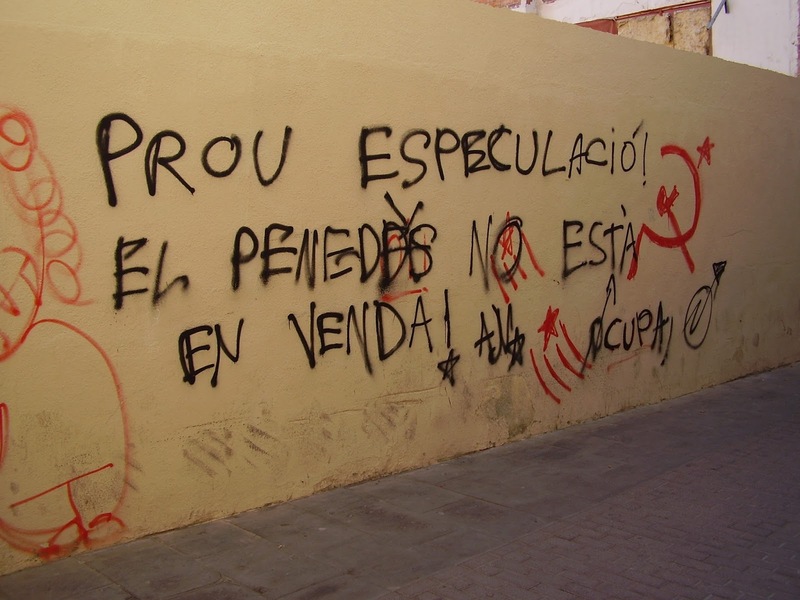 Almost anyone would see the common sense in a group of energetic and optimistic young people making good use of a long-abandoned building, as with the Vilafranca squatters group. However, the question that does remain is: How should this happen, both legally and ethically?